Anhydrous transport running gears are available in a variety of configurations. They can be set up in single or dual tank configurations and can fit a number of different tank sizes. Our anhydrous running gears are also available in numerous track widths, making it easy to find what will work best for your field or cooperative. As one of the pioneers in the sprayer trailer market, we have experience that few can match. 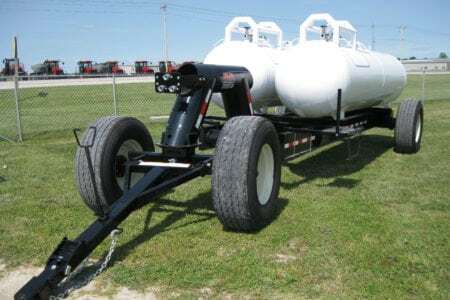 Sprayer trailers are easily customizable and available in a variety of different lengths, capacities, and hitch styles. This makes finding the perfect combination for your brand sprayer a walk in the park. Our tender trailers are built to accommodate either dry or liquid fertilizer tenders. Available in a variety of different lengths and weight capacities, you should have no problem finding the tender trailer to fit your specific needs. Our talented engineers are also able to include value added features; such as laser cut holes and cut-outs in the frame to match most major manufacturers specs, this makes the mounting of the tender a breeze. Vertical cone tank trailers are available in a number of different configurations and can be designed to carry whatever brand tank you desire. Our cone trailers can carry from one to three vertical cone tanks. 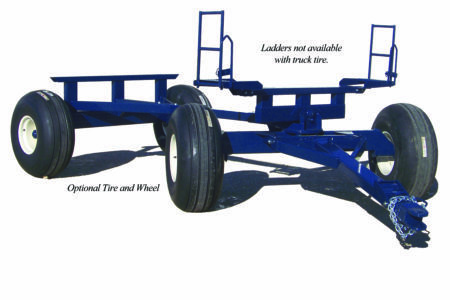 These trailers are designed to give the end user a portable fertilizer storage solution. A single cone transport model is also available.